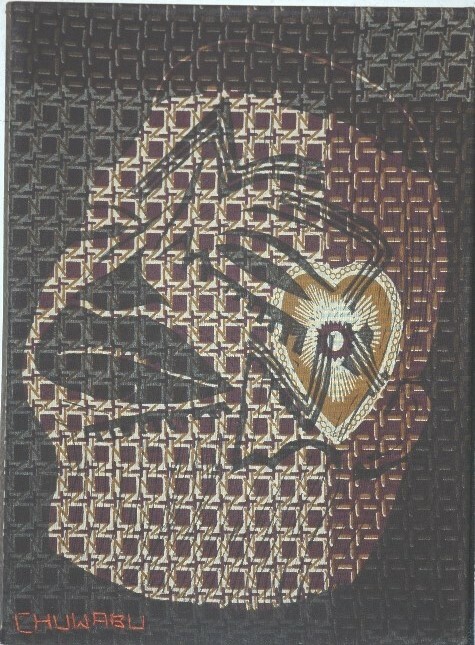 Mother tongue 2006 was an installation of lino print on textile with embroidery and sound/voice by Steve and Refiloe Dyer. The work 'Mother tongue' was made in response to Ann's first visit to Maputo in April 2006. She heard Portuguese spoken everywhere around her. The silence of the many mother tongues of Mozambique that associate each person with a particular tribe and culture intrigued her. She was given a beautiful poster of a Makonde mask to take home with her to remind her of the rich cultural heritage of Mozambique. 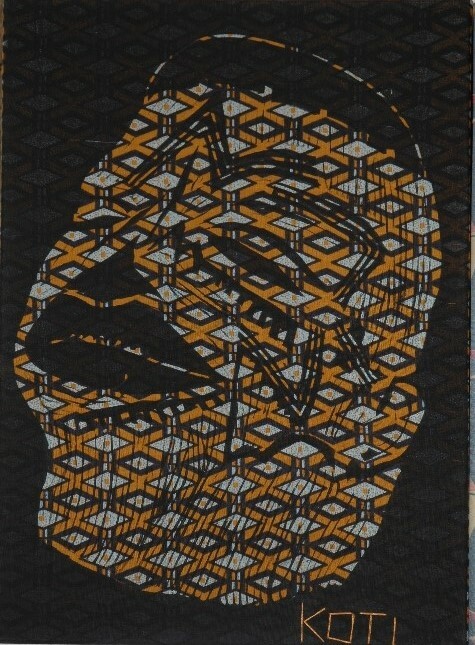 When she returned to Gaborone after the trip, she made a linocut of a Makonde mask and printed an image for every one of the major mother tongues she found on the internet, 41 in all. she printed the mask onto 41 different pieces of wax-print and stitched the name of a different mother tongue onto each piece. In 2014, a second version of this work, Mother Tongue #2 , was acquired by the British Museum for its permanent collection and was installed in the Sainsbury Africa Galleries. The British Museum, Russell Square, London. Introduced by Chris Spring, Curator of the Sainsbury Africa Galleries. As Chris has pointed out, the artists Sokari Douglas Camp and Magdalene Odundo, were the catalysts for the marriage of the contemporary with the traditional, that is so beautifully displayed within the cases of these Africa galleries. This concept of displaying the old with the new has given a current voice to the works exhibited here. Traditional artifacts are made relevant in the dialogue that occurs between the older collection and contemporary work of individual artists that has been inspired by those very traditions. The notion of darkened rooms filled with strange and muted objects, collected long ago from a distant culture is simply blown away along with all the cobwebs, when you walk through these light filled galleries and are confronted by this loud and very contemporary conversation between the past and the present. About one third of the contemporary work in the permanent collection is by women, including the four individual artists I will be talking about this afternoon: Ann Gollifer, Magdalene Odundu, Sokari Douglas Camp and Susan Hefuna. All four of the women have taken ideas from generally male dominated societies and reinterpreted them, turning what was a collective male voice into that of an individual woman, one who speaks for humanity as a whole. All four artists work as individuals within their own studio practice. Their work, deals with issues surrounding identity and transformation. The work of all four women draws on visual traditions found within the multiple, physical worlds into which they were born, within which they live and that they represent. Often their work draws on the traditions of a collective mind, the masquerades of male initiations, the work of craft producers along a river system, the social furniture and architecture of a people. They take these visual cultures, refined over time by whole communities and reconstruct them to fit a very contemporary and individual need to understand, where one comes from, where one is and where one is going. I was born in 1960 in British Guiana, now Guyana. I am a painter and printmaker and my work deals with history and issues of identity and belonging. I am drawn to sources of inspiration that are all around me in every day life, like the printed cottons that people wear. This fascinating cloth carries within its warp and weft, images that refer to forgotten histories juxtaposed with current trends. In 2006 I was invited to have a solo exhibition in Maputo at the National Art gallery. On a visit to Maputo before the exhibition I was given a poster, its main motif was a photograph of an iconic Makonde mask. Portuguese, the language I heard spoken all around me, struck me. I asked everyone I met about his or her own specific African Mother Tongue. I decided that I would make a work for Mozambique that would reflect this language issue. I bought 41 different pieces of Capulana, the name given to the printed cotton cloth that women use daily to wrap around their waists and shoulders and in which they carry their babies and shelter from the sun or rain. 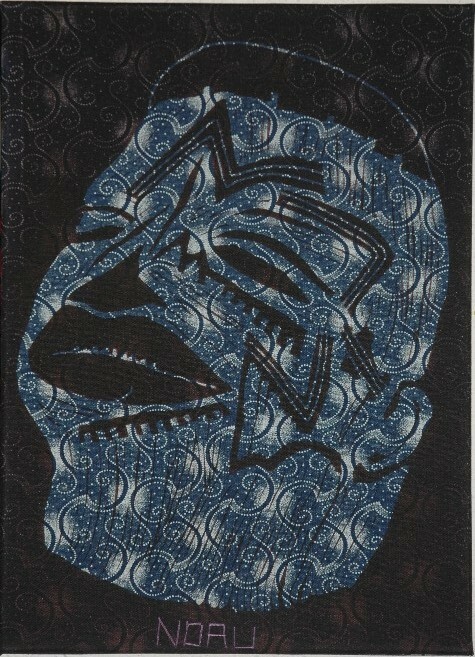 I made a lino cut of the Makonde mask, taken from the image on the poster and printed it onto each piece of cloth, 20 in black and 21 in white, for unifying rhythm across the multi-colour. There are 41 African Mother tongues spoken in Mozambique, there is many more than this number, but 41 represent the major language groups. On each piece I then embroidered the name of one mother tongue. The work is a multiple of three. The Sainsbury Africa Gallery owns #2. In the work Mother Tongue, I have commented on the use of the Makonde mask as a unifying cultural symbol of contemporary Mozambique. The Makonde, reknowned warriors and artists, sold their carvings to fund Samora Machel’s fight for leadership of the new nation. Their women also took up guns to fight beside the men and in so doing earned to right to create their own female version of the male masqerade.The capulanacloth, originally imported from and designed in Europe, is worn by all African women regadless of tribe or design, and has come to symbolise a contemporary and proud african identity. Portuguese currently unifies the many tongues within Mozambique, despite its Colonial origin. At the time I made the piece I was unaware that the image of the mask I found on the poster was in fact the mask that is in the Africa Galleries’ permanent collection and currently on display in the Galleries.Mother Tongue has found its place along side the mask it was inspired by and continues the conversation here in London, on this most public platform. Magdalene Odundu was born in Kenya in 1950. She came to the UK in 1971 to study Graphic Design and discovered clay instead and found her voice as an artist. She was initially influenced by pre Columbian pottery and nurtured by teachers and tutors in London. She says that a major inspiration has always been the river Nile itself and the variety and bustle of life and work that takes place all along its banks from its source at Lake Victoria, to its final destination through Egypt to the sea. Magdalene is best known for her work with clay but she works in a wide variety of mediums, sometimes on paper, sometimes in blown glass, drawing on that energy and diversity she has witnessed along the length of the Nile. She started her carreer in ceramics with thrown and glazedtable ware. From there Magdalene’s interests gradually brought her to the study and application of hand built vessels, based on ancient coiltechniques that she found in Africa, India and New Mexico. This turn towards hand built vessels placed her work in the realm of sculpture, inspired by European and American modernist models. She also gathers ideas from a wider variety of sources, looking for example at the flared, standingcollars and bell sleeves of period costume design. She transfers particularshapes and styles ontoclay vessels, giving a particular piece or body of work, its signature character and reference. Ultimately her work is a search for perfection. She carefully builds up her clay vesses over months, even sometimes working on a piece for several years. She is known for her rigorous burnishes before a first firing, and again afterwards, to get a particular finish and colouring. She uses hot kilns or cooler kiln, polished slips, oxsidised slips, aerobic ovens or oxygen starved ovens to create the perfect forms she searches for time and time again. Her clean, pure forms are suggestive of the human, female body. She speaks about the inspiration she finds in tribal scarification with particular reference to her own mother’s body and how she finds within those memories of that body a celebration of the full and rounded female form. You can see on her pots the use of puckers that call to mind the female scars that signified transformation from girl to womanhood, identity change, metamorphosis. Her vessels present an outer perfection that seem to hold within themselves a secret inner life. Born in 1962, is Egyptian- German and calls the very streets of Cairo her studio. In her work she continually confronts the duality of her background, the back and forth between here and there, between Europe and Africa, between the North and the South, between the urban and the rural. She conceptualises work as she walks through the streets of Cairo. She makes drawings in hotel rooms and in airport lounges as she travels between places and spaces. She is inspired by structure, architectural form, windows, doorways that present both obstacle or pathway, for the visual or physical, between the inside and the outside, the visible and invisible. The work on display in the Africa Galleries is a mashrabiya, the traditional wooden screen that works as an air vent in Egyptian house walls, a traditional air conditioner, a screen that separates the outside from the inside, the female from the male, the private from the public, both metaphorically and physically. Susan uses the mashrabiya as vehicle and metaphor in her work. These beautiful wooden screens are made by skilled craftsmen who she commissions to make contemporary screens designed, containing statements, sometimes in Arabic script and sometimes in the English language. Often the viewer must walk away some distance from the screen to be able to see the texts embedded within it. When the work is exhibited in Cairo it holds different meanings to those that it holds, when exhibited in Germany or the UK. The Egyptian experience, when viewing Susan’s work is triggered by an intimate knowledge of the mashrabiya as an architectural form, embedded in cultural memory. In Europe the screen is unfamiliar, exotic even, and therefore triggers a different response. The screen echoes what the artist herself experiences as she moves through one world into another. Just as the meaning of the screen and how it is percieved, changes in every situation, so too does Susan’s meaning as person and artist. It seems to me that Susan, like Magdalene, is also searching for a perfection and balance. She uses the screen as a metaphor for meditation and silence. She says that she likes to sit behind a mashrabiya, in the quiet, cool dark interiors, invisible from the busy street beyond, where she is protected from the heat and noise outside, in her own private space. “The mashrabiyas are kind of ‘meditation Screens”. People should meditate/think about what is written there or just observe in an abstract way. That is part of the work. I do not explain or give instructions on what everything means. The meaning of works even change for myself over the years. Susan has taken a traditional, predominantly male craft and used it in her personal search for meaning, and in her reconstruction, she has found a contemporary and relevant voice in the currant discourse around identity and belonging. born in 1958 in Kalabari, the Niger Delta. Sokari is a sculptor and draws inspiration form her Kalabari heritage and the male masquerades that celebrate initiation. Her work is about tranformation and metamorphosis. Not only figuratively but also on a very personal level. Her hippo masquerade was voted one of the 20 most loved pieces in the British Museum’s contemporary collection by the Director, Neil Macgregor. Her work though seeming lighthearted and humourous, is supported upon a strong steel structure that lends her pieces a sometimes spectacular presence. She has taken a male subject matter, the Hippo masquerade, and what was once a male dominated practice within the visual arts, steel assemblage, and made it her own as a contemporary female artist. She shot the video that is on the opposite wall, featuringyoung male initiates, practising for their masquerade in the Niger Delta. She would not have been allowed to video the real thing as a woman. She has also organised for the Kalabari masquerade to come to London with controversial results. Sokari has been an influential and passionate advocate for contemporary art from the African continent to be given a platform within the international visual arts scene. The Sainsbury Africa Galleries is testament to this commitment.